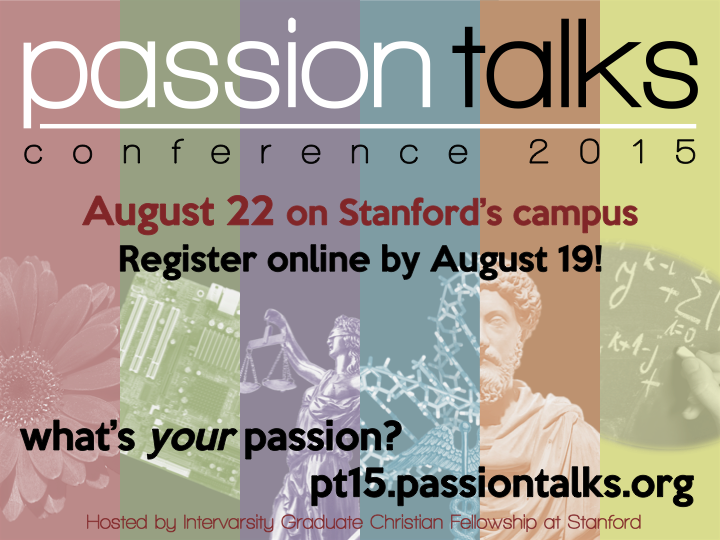 We are one day before the Stanford Passion Talks Conference. The schedule is listed below. Click here for the official website. The conference starts at 9 am on Saturday and will held at the Stanford School of Medicine, Alway building, rooms 106, 112, and 114. See below for directions and parking instructions. Once parked, enter Alway through an opening located in the southeast corner of the large hospital building (marked by the star above). The following directions are to the intersection of Campus Drive and Roth Way. Exit onto Embarcadero Road and travel west, following the signs directing you to Stanford University. About three miles after you exit the freeway, Embarcadero Road becomes Galvez Street as you cross El Camino Real. Stay in the left lane and continue past the stadium. Turn right onto Campus Drive and continue until you reach the intersection with Roth Way. Parking available to both the right and left. Exit onto Sand Hill Road and follow the signs for Stanford University. Heading east, drive approximately 2.5 miles and turn right onto Stock Farm Road. Turn left onto Campus Drive and continue until you reach the intersection with Roth Way. Parking available to both the right and left.